Following onto the hugely successful Driver Training Course, The School Bus Safety Company has now created a comprehensive training program for the drivers of Students with Special Needs. This course includes seven DVD’s, a trainer’s guide, a driver study guide and a job aid summary. 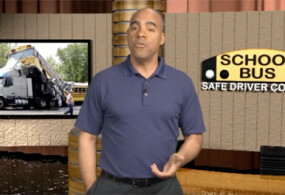 Use this special needs school bus safety video to help your drivers provide professional service. Safely and correctly transporting Special Needs students has its own challenges and this course addresses every issue to help the driver provide the most professional service possible. The DVD’s show exactly how and what to do under every scenario. Training using high quality DVD’s is far better than using PowerPoint or just manuals. The best materials create the best and safest drivers. Be sure your drivers have the training they need to provide your students with a safe ride. This course is complete with DVD’s, guides and job aids for your drivers. A Classroom Trainer’s Guide with instructions on how to teach each lesson. Cost of the kit is $1795, including materials for all seven programs and one of each guide. Additional copies of the guides are available separately at a nominal cost. Contact us for quantity pricing.